Not much to say today. 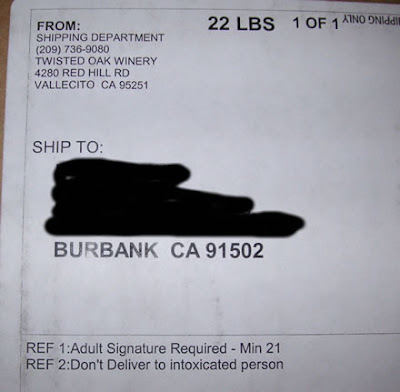 Just thought I'd post the shipping label from a wine order that arrived last week that I found amusing (see REF 2 at the bottom). Is that sort of like those signs that say "warning, carry pizza horizontally, not vertically," or "warning, coffee may be hot?" But then I live in the looney bin state, California, where you have to warn everybody about everything lest vulturis attorneyas descend upon you. I wonder if FedEx reps are edu-mi-cated and cert-i-fied to identify intoxicated persons? I've laughed at the same reference and wondered, wow, Fedex folks have a lot of responsibilities! No disrespect for FedEx, I love my delivery guy, which shows up with a new wine shipment every other day. Which reminds me I have to buy him a gift or a drink for all the deliveries!! !